The Daily Press and residents of the Victor Valley in the western Mojave Desert are issuing a PRIDE (People Ready to Improve the Desert Environment) challenge to address the many facets of blight that are evident in the region. As a kid playing in the open desert across the street from my Victorville home in the 1980s and 90s, I would find trash dumped by residents too lazy or cheap to responsibly dispose of tires, furniture and other refuse. The City of Victorville, one of the largest population centers in the western Mojave Desert, is nearing insolvency under nearly $500 million of debt, according to the Wall Street Journal. Victorville has mishandled millions of dollars of bonds accounts and shifted funds without city council authorization. The city has already slashed many of its employees from the payroll, and many citizens complain of deteriorating infrastructure and crime. Nevertheless, Victorville is still investing in ambitious and unnecessary plans, such as a 32 square mile expansion and the High Desert Corridor (E-220), a new highway connecting Lancaster and Victorville. Most residents probably would prefer the City reinvest in existing infrastructure and open up a new east-west route within the city (the Nisqualli overpass) to alleviate burdensome traffic before expanding the city limits and building an unwanted highway. Victorville Mayor Rudy Cabriales once again decided to delay Victorville City Council's consideration of supporting or opposing the California Desert Protection Act of 2010, according to the minutes from the 2 March meeting. The Council will now consider the legislation again during its 16 March meeting. According to the minutes, Mayor Pro Tem Mike Rothschild and Councilmember McEachron had "comments" on the legislation but the notes did not specify. For any readers of this blog that were able to attend, feel free to share with us what comments were made by those Coucilmembers. Legislation introduced by Congressman Howard McKeon in December and recently supported by Senator Barbara Boxer would resolve a longstanding dispute between CEMEX and the City of Santa Clarita, which opposed a 1990 contract sponsored by BLM granting CEMEX rights to extract sand and gravel from Soledad Canyon. 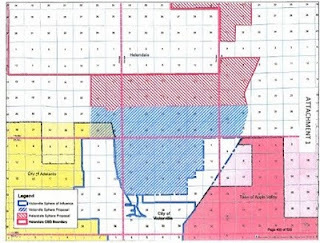 In order to resolve the dispute, the legislators propose selling BLM lands--already on the Bureau's "disposal list"--in the vicinity of Victorville and use the proceeds to compensate CEMEX. The City of Victorville and San Bernardino County would have first rights to purchase the land. Reviewing the draft environmental impact report (EIR) for the proposed 1,555 acre "Hacienda at Fairview Valley" residential project (for more info, see my previous post), a Joshua Tree survey identified at least 3,891 Joshua Trees on the proposed site. County regulations would require the developer to attempt to avoid impacts to Joshua trees and preserve in-place to the farthest extent possible in order to achieve a “design of excellence.” If the project progresses toward construction, the developer would have to submit a Joshua Tree plan that identifies specific trees to be transplanted or stockpiled for later transplantation or future adoption. The Apple Valley Town Council will reconsider its position on the California Desert Protection Act of 2010 (CDPA 2010) at tonight's meeting, and the Victorville City Council will consider its position on CDPA on 2 March. As of 16 February Victorville Mayor Rudy Cabriales was not sure he had enough information to make an informed decision, and Council Member Caldwell was opposed, citing concerns that military training and mining interests would be impeded, according to minutes from the February meeting. The Victorville City Council postponed a vote on a proposal to expand the City's sphere of influence by up to 32 square miles, according to the minutes of its 5 January meeting. The proposal will now be addressed on 19 January after the Council discusses the proposal with San Bernardino County and the City of Apple Valley. You can read more about the original proposal on this post. A review of the City's proposal suggests the City seeks to maintain some open space within the proposed expansion, although the intent to spur more residential development along more of the Mojave River. Here is an approximate reflection of the area that could be affected by the expansions of both Victorville and Helendale. 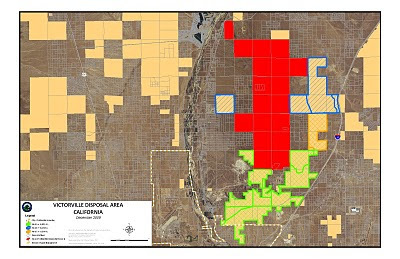 In what would be one of the most significant municipal expansions in the West Mojave Desert in recent years, the City of Victorville will vote tonight (05 January) to expand its sphere of influence by up to 32 square miles. The City's vote may be hurried by a similar plan by the City of Helendale to also expand its sphere of influence, conflicting with Victorville's proposal. Victorville officials have already expressed their desire to bring resident development to the land, although San Bernardino County has expressed reservations with the extent of Victorville's proposed expansion, fearing that mineral and natural resources would be abandoned in favor of more residential growth. Another resource taken for granted in the Mojave Desert -- clear night skies. 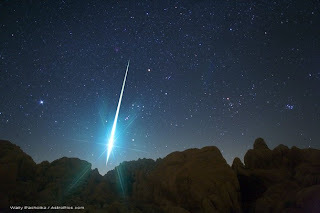 Check out this photograph taken outside of Victorville that captures a Geminid meteorite as it crosses the night sky above the Mojave, as posted here.